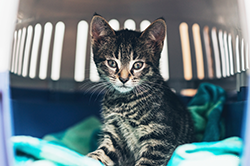 Whenever you take your kitty to the veterinary hospital, it’s always a good idea to arrive with a written list of your questions for your veterinarian. You may have a crackerjack memory, but it’s easy to become forgetful or distracted in the hospital setting. After your veterinarian is through explaining things, you can reference your list to see if all of your questions have been answered. What are the right questions to ask? In addition to the questions that pertain to your cat’s specific health issues, I recommend asking the five general questions below. By the way, it is important to ask them at each annual visit as the answers may change from year to year. 1. Is my cat at a healthy weight? While it’s unusual for a healthy cat to be too thin, it’s very common for an otherwise healthy cat to be overweight. A study by the Association for Pet Obesity Prevention found that 53 percent of cats were overweight. Just as in people, feline obesity predisposes to a number of health issues with diabetes at the top of the list. Veterinarians sometimes fear pointing their finger at the fat felines in front of them for fear of offending their clients. 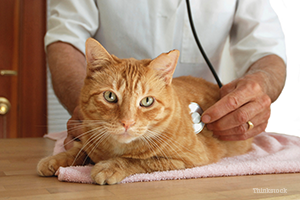 Asking the question yourself will make it easy for your veterinarian to have candid conversation about your cat’s body condition. 2. What should I feed my cat? Speaking of body weight, how about learning more about what type of diet will best support your cat’s health. Ask about canned versus dry food and whether or not your veterinarian prefers a particular brand for your kitty. Recommendations will be based on your cat’s life stage (kitten, adult, middle age, senior), lifestyle/activity level, and health issues. 3. Which vaccinations are appropriate for my cat? There are no “one size fits all” vaccination protocols. In order to answer this question, your veterinarian must know a good deal about your cat’s lifestyle. What is his prior vaccination history? Does he ever go outdoors or contact other cats? How many kitties are there in the household? Where does your cat stay when you go out of town? Also, let your veterinarian know if your cat has ever experienced a negative reaction to a vaccination. 4. Should I be doing anything differently at home? Your veterinarian may recommend that you change things up at home for your kitty. Her request might be as simple as increasing litter box access for your older cat with a bladder issue or as complex as obtaining blood sugar measurements from your diabetic kitty (of course, any such requests are always subject to negotiation). 5. When should I bring my cat back? Whenever you and your kitty see your veterinarian, always find out what is supposed to happen next. Perhaps your vet would like you to call her in a couple of weeks with an update on how your cat’s cough is responding to medication. She may ask that you bring your cat back to her office for a follow-up visit in four months. Or, if your cat is in excellent health, your next recommended visit may be in a year. The goal here is to always come away with a plan.